Moore Street Market was a lunch spot for the stars of “Safe Haven,” which was filmed in Southport and came out on DVD last week. 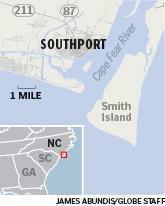 Seafood restaurants populate the Southport Yacht Basin, where the Cape Fear River meets the Atlantic Ocean. 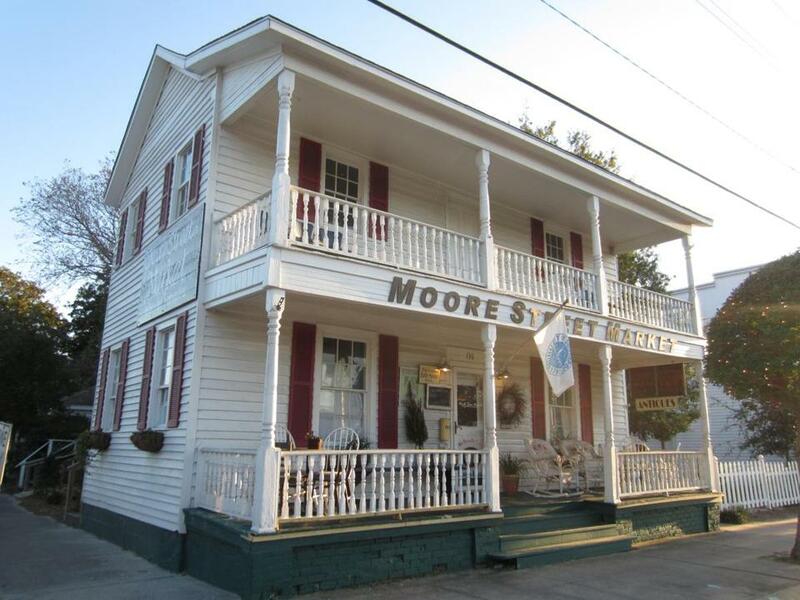 SOUTHPORT — With maps in hand, Nina Walsh and Mary Koehler gazed up at Moore Street Market, a popular cafe housed in a historic wood-frame building in this picture-perfect town on the mouth of the Cape Fear River. “When we saw the movie, there it was, and I thought, hey, I ate lunch at that store,” Koehler said. The friends, who live in nearby Leland, had made a return trip to Southport after seeing the romantic thriller “Safe Haven,” based on the novel of the same name by Nicholas Sparks. But “Safe Haven,” released last week on DVD, stands out because the town itself plays a leading role. If you’ve seen the film, in which Katie (Julianne Hough) winds up on the Carolina coast after fleeing a dangerous Boston police officer and then falls for local shop owner Alex (Josh Duhamel), you probably agree that Southport steals the show. With a few exceptions, everything depicted in “Safe Haven” exists — a picturesque harbor, small retail shops dotting a lively downtown, streets lined with Victorian homes, stately oaks draped with Spanish moss, and bustling waterfront seafood restaurants. And, yes, the town of 2,900 residents really does host an exuberant July Fourth parade — officially the North Carolina Fourth of July Festival — that attracts upward of 50,000 visitors. Last year’s parade was even reenacted a month later for the filming, using townspeople as extras. If you go to Southport, N.C.
Like Walsh and Koehler, I’d started my tour at the waterfront Southport Visitors Center and Museum, housed in the 1810 garrison house built for officers at Fort Johnston. Only the house, a plaque, and small sections of crumbling tabby walls remain on the site, established by the British in 1745. One museum display is devoted to Southport’s literary luminary, Robert Ruark, who spent summers here in the 1920s with his grandfather, the inspiration for his “The Old Man and the Boy” magazine series about their outdoor adventures. But the bulk of the space is filled with “Safe Haven” memorabilia, everything from on-location photos to actors’ articles of clothing and an impressive array of props from pivotal scenes. Most items were handpicked by Cindy Brochure, Southport tourism director and film liaison, who credits the film with the town’s skyrocketing popularity. I learned that two in-demand film sites could not be visited. Ryan’s Port Market, Alex’s shop, was built for the movie and later torn down, though Brochure managed to nab its charmingly stubborn door for display, and Katie’s shabby-chic home was squirreled away on private property miles from town. I had to break the news to Walsh while we compared notes on the street corner. No, I told her, before directing her to the next best thing: the Ricky Evans Gallery, where I’d been lured in by a sidewalk cart touting “Safe Haven Art.” Inside the 1920s bungalow, I found Evans’s prescient handiwork — framed giclee photographs on canvas of Katie’s cottage, Ryan’s Port Market, Ivan’s Fish Shack (where Katie worked and in reality the Old American Fish Co.), and other scenes from the movie, which Evans got permission to shoot during filming. Tour guide Rick Pukenas isn’t surprised by visitors’ reactions. He and his wife were similarly smitten during a search for a property to buy. Last year they took over the 1890 Robert Ruark Inn, the launching point for the late author’s work. The idea for Southport Tours grew out of Pukenas’s free golf-cart tours for guests. I signed up for a basic history tour that included film sites — occasionally one and the same. When we stopped in front of the restored Old Jail, the former 1904 county jail and now home to the Southport Historical Society, he said, “Guess who the most famous prisoner here was.” As I racked my brain for names of Carolina criminals, he answered, “Sissy Spacek. ‘Crimes of the Heart.’ ” Of course. Across the street is the Old Smithville Burying Ground, the 18th-century graveyard bearing the original town name, where an obelisk marker honors lost river pilots and where, I later learned, a scene from “Under the Dome” had been shot. We tooled down the main drag to Waterfront Park, where folks filled the swings and benches facing the river. As we passed the river pilots’ tower, Pukenas pointed out radio call letters WYBS on the side — for the station in “Under the Dome.” Our final stop was Southport Yacht Basin, where the river meets the Atlantic Ocean. It’s home to several seafood joints with waterfront views, including Old American Fish Co., a.k.a. Ivan’s. The real Ivan’s doesn’t serve food, but, along with Fishy Fishy Cafe, a few buildings up, it’s the perfect spot for a sunset toast. A block away, Pukenas showed me the 1879 Grey Burriss House, where Alex lived. Just as he pointed across the street to where Ryan’s Port Market had been, two women in a minivan inched past us scoping out “Safe Haven” sights. Pukenas handed them his card and they were waiting for his next tour by the time ours was finished. I didn’t want to leave the area without checking out the hauntingly beautiful black-water cypress swamp Katie and Alex had traversed in a canoe, but I learned the filming had taken place on private land. So I went to Emma Thomas, owner of the Adventure Company, a kayak and bicycle outfitter and tour operator, for location advice and to confirm what I’d suspected — the paddle scene in the film, while romantic, was unrealistic because Katie, in front, faced Alex and paddled backward. “Correct; you’d never do that,” Thomas said, before pointing me to Rice Creek, a similar setting 20 miles up the road. As I glided past centuries-old bald cypress trees, watched turtles sunning, and listened to a pair of chatty barred owls, remnants of tinsel town vanished. Thomas later reported she’d been receiving numerous inquiries from people wanting to re-create Katie and Alex’s outing.